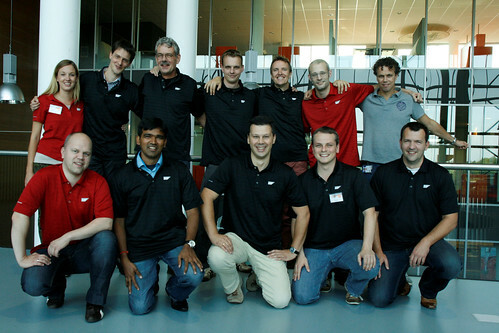 The SAP InnoJam 2012 in the Netherlands is already 3 weeks ago and looking back I must say it was again a very interesting event. But let’s fast re-wind back to September 7th at 8:30am. People started coming-in into the SAP office in ‘s Hertogenbosch and were welcomed by the VNSG who co-hosted the event with us. At the end we’ve had a around 40 participants who were eager to get started. After a short intro and opening words from Jan Koster we moved rooms and started the Desing Thinking exercise of the event. How can we help people with “high risk” heart failure to prevent a serious condition (stroke) by using remote monitoring? How can we ensure to prevent healthy people from getting heart diseases, by educating them? How can the IT department of Haga Hospital help to reduce the high number of no shows at their heart clinic? We formed six teams and the blog from my colleague Hester Hilbrecht called “Dutch scored multiple victories @InnoJam” summarizes nicely these first 6 hours of the SAP InnoJam event. There’s also a Youtube playlist with all the videos recorded during the Design Thinking exercise. After the teams finalized their exercise they went right into coding. A few of them stayed overnight to complete what they were trying to achieve. But like with all InnoJams the coding comes to an end when it’s time to present their prototypes to the jury. All teams had to present their prototypes to a jury consisting of Jelle Brouwer from SAP (Account Executive Healthcare), Rob van der Marck (Director VNSG) and Haseenah Penninkhof (a patient). At the end team 6 won the event just a heart beat in front of team 5 who got second and team 4 that got third. As always it was a very fun event in the Netherlands and we are very grateful for all the feedback people provided after the event. We’re using that feedback to make the next SAP InnoJams even better for you. Thanks to everybody involved in the planning and execution of this event specially all the colleagues from the VNSG, the SAP technology experts, the Design Thinking coaches, my fellow team mates at the event and behind the scenes and all the others who helped putting this event together!! A very special thanks to Haseenah Penninkhof who was at the event as one of the interviewees and as a jury member. So come to one of the next SAP InnoJams and find out yourself why people like this event series so much. In case you need some help in convincing your boss to come to one of the next SAP InnoJams forward my blog “Top 10 reasons why your boss should send you to an SAP InnoJam event” to her/him as an additional source of information for the decision. Nice wrapup blog of the event, I believe your blogs as well as those by Hester Hilbrecht and Uwe Kylau captured the mood perfectly. I am really looking forward to next year’s SAP InnoJam Netherlands event, and I can wholeheartedly recommend to anyone not familiar with the InnoJams to participate in one of the next events! Yes, it really is that much fun!